Searching for a flight can be a bit overwhelming. There are so many factors: dates, times, price, fare class, airline, and more. Even when you know exactly when and where you want to fly, where should you look for the absolute best price? Unfortunately, no website consistently has the lowest prices. Most of the popular OTAs (Online Travel Agencies) are usually in the same ballpark for the price, but not all offer the same benefits or search functionality. We’ve combed through many popular OTAs to compare prices and show you the benefits and drawbacks of each site. More often than not, booking directly through the airline’s website will give you the best price, or will at least be the same as the OTAs. Some airlines, like Southwest, won’t even show up on sites like Expedia or Orbitz, so you have to book direct. It can also be the most simple way to book. If a problem arises, you don’t have to deal with a 3rd party to get it resolved. Another reason to book directly through an airline’s website is to use frequent flyer miles — hooray for award flights! Of course, to book through the airline’s website, you first need to know which airline has the best prices. There are lots of travel search engines and OTAs that can help you find the best deals, so you know which airline’s website to visit. Some OTAs even offer perks that might make it worth booking someplace other than the airline’s site. Hot Tip: When booking on these sites, we like using the Chase Sapphire Preferred® Card which earns you 2X points on all travel (and dining) purchases. Right now, this card has a huge 60,000 point sign up bonus — that’s worth $750 when used for booking flights, hotels or even car rentals at Chase Ultimate Rewards travel portal. Expedia is another tried-and-true OTA that people have been using since the 1990s. Back then, Expedia was a go-to source for searching and booking flights. But how do they stack up now? I searched for a round-trip flight from Columbus (CMH) to Minneapolis (MSP) on Expedia, United’s website, Orbitz, and Priceline. All were the same price except Orbitz, which charged a small booking fee. As far as price goes, you aren’t necessarily getting a deal booking through Expedia, but you aren’t paying any more than you might on the airline’s website. Expedia offers a rewards program, but I’m unimpressed with the earning potential through flights. The rewards program offers more benefits when booking hotels. While you can earn miles on a flight booked through Expedia, you often won’t be able to earn miles toward status. You also might not be eligible for seat upgrades. Expedia offers a rewards program, but the earning potential through flights isn’t great. Booking through Expedia may limit your mileage earned toward elite status. Your ability to be eligible for upgrades can be limited when you book through Expedia. Priceline is a popular OTA that introduced the Name Your Own Price tool and opaque bookings. These types of bookings can offer discounts, but many of the details are hidden until after the booking. The Name Your Own Price tool was discontinued for flights in 2016, so now Priceline operates like most other OTAs out there. Testing for a couple of different flights revealed all were the same price across the board on other OTAs and on the airline’s own website. Keep in mind, this isn’t always the case, but generally, the price you get on Priceline will be in the ballpark of the flight cost on other websites. 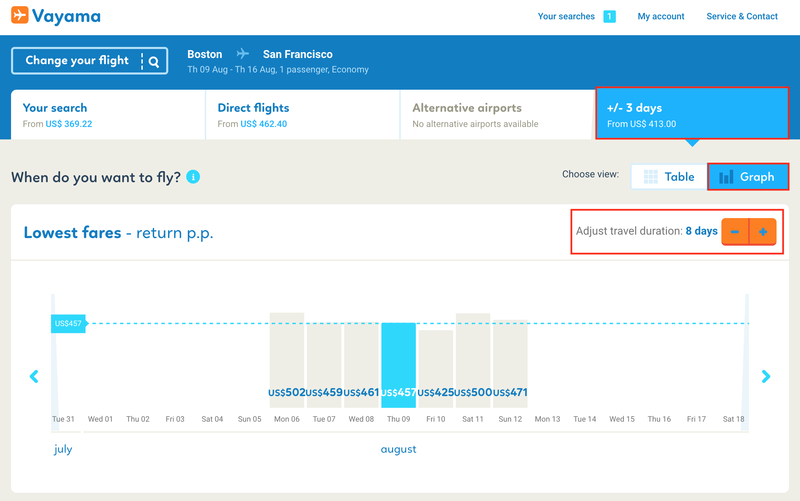 Hot Tip: An “opaque booking” is one in which select details of the flight like the departure and arrival times and even the airline are hidden until the booking is complete. Express Deal flights. These flights can offer a good discount if you have some flexibility. Many of the details of the flight including airline and arrival and departure times are hidden until the booking is complete. Priceline doesn’t offer the ability to search for flexible dates. Even having a day or 2 of flexibility can save you money. Express Deal flights. While these can be good deals, they aren’t always. In the example below, the Express Deal is only saving $19.12, or about 4%. Sometimes, it’s worth a little extra to know exactly what you’re getting. 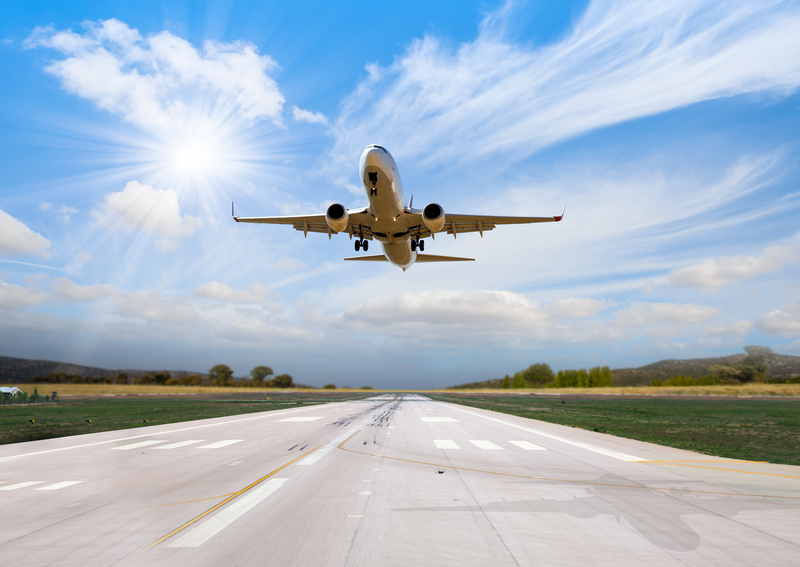 Priceline’s Express Deal flights can save you money…if you have some flexibility! Bottom Line: For more information about booking travel and finding deals through Priceline, check out the complete guide to booking travel with Priceline. Hotwire is a popular OTA that has been around for almost 20 years. The simple home page offers a main search box to input your departure and arrival cities as well as your desired dates of travel. You will need to click on the third tab in the main search box to access the flight search. Hotwire can offer a great deal when booking a hotel along with your flight. Many times during the booking process, you’ll see pop-ups or prompts advertising great savings when booking a hotel at the same time. I tested it, and every time I priced out a Hotwire vacation package deal against purchasing a flight and hotel separately, the package deal won. Bottom Line: If you need a hotel in addition to your flight, booking both together through Hotwire can save you hundreds of dollars. When searching for your flight, you might come across a Hot Rate flight. These are flights in which the exact times, number of stops and carrier are hidden until after your purchase is complete. These require a fairly large amount of flexibility and I found the price difference to be as little as $20. They can sometimes offer a great deal, but many times, there isn’t much savings. Hotwire can save you money when you book a hotel and flight together. Hotwire can sometimes charge a booking fee. Hot Rate flights don’t always offer a huge savings. Bottom Line: For more details about booking travel and finding great deals through Hotwire, check out our complete guide to booking travel through Hotwire. Orbitz is another reliable OTA that has been around since 2001. One thing that makes this site a little different is they offer their own rewards program called Orbitz Rewards. You can earn Orbucks when you book hotels, flights, and vacation packages through Orbitz. However, you can only redeem Orbucks for hotels. When booking a flight through Orbitz, you’ll earn 1% of your purchase price back as Orbucks. If you book a $500 flight, you will earn 5 Orbucks, which is worth $5 toward a hotel booking. Joining the Orbitz Rewards program is free. Orbitz Rewards lets you earn Orbucks that can be applied to hotel bookings. Low Price Guarantee: If you find a lower price for your flight on another website within 24 hours, Orbitz will refund the difference. Orbitz often charges a booking fee. 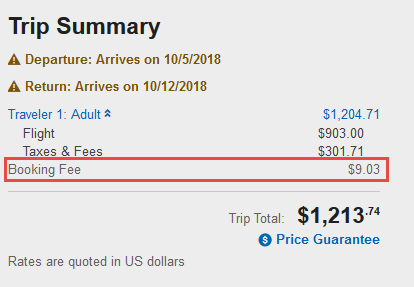 Look out for the fee on your trip summary page before finalizing your purchase. Keep an eye out for the booking fees Orbitz sometimes charges. Bottom Line: For more information about Orbitz Rewards and booking travel through Orbitz, check out everything you need to know about booking travel with Orbitz. Agoda is an OTA owned by Priceline. This website doesn’t offer much more than a simple search with limited filter options when looking for flights. If you’re looking for unique accommodations such as an apartment or private villa, Agoda is worth checking out, but they don’t offer much when searching for flights. One cool thing about Agoda is the site is multilingual. You can select your language by clicking on the flag in the top menu bar. You can easily change the language on Agoda by clicking on the flag icon in the top menu bar. Hot Tip: OTAs and metasearch engines don’t have access to Southwest prices. If you want to search and book Southwest flights, you need to go directly to Southwest.com. Just make sure to maximize the number of Southwest points you’re earning before making your booking! Momondo is a travel metasearch engine similar to Kayak. The home page displays a simple search box where you can plug in your travel details. One of the things I love about this site is the super visual way they show you the price trends for your flight. At first glance you can tell if you could save some money by shifting around your travel dates a bit. They also offer a price tracker and lots of filtering options at the left hand side of the screen. They also offer Mix and Match fares which are simply 2 one way tickets from different providers packaged together to get you the best deal. However, unlike other sites, to book these types of tickets you do have to go to 2 separate websites to book. Mix and Match fares require you to make 2 separate reservations. This is usually handled “behind the scenes” on other websites. cheaper flights?Use the sign up bonus from the Chase Sapphire Preferred® Card (worth $700 when using via Chase’s travel portal) to pay for your flight(s). Kayak is not an OTA; it’s a travel search engine. And since it’s a search engine, it’s a great place to start. Kayak compares prices from many different websites all in a single spot so you can easily see where the cheapest options are. Most of the time, you’ll end up clicking through to a different site to complete your booking. Hot Tip: You can set up free alerts on Kayak to keep tabs on prices. Kayak hacker fares are a great way to save money on your flight. These are itineraries created by bundling 2 one-way tickets (usually on different airlines) instead of a round-trip on 1 airline. These can be pretty good deals, and something that doesn’t always appear in search results of other websites. Keep an eye out for the Kayak price tracker and Kayak hacker fares, 2 great features that make Kayak a great place to search for flights! Kayak offers the most benefit when your travel plans are very flexible. Many of their most valuable tools help you search for deals, so this site might be less appealing when you have a specific flight in mind. Bottom Line: For more information about Kayak hacker fares and Kayak’s other travel search tools, check out the complete guide to booking travel with Kayak. Skyscanner is another travel search engine that does not sell flights directly. They show you a list of flights and link to the airline’s website or OTA to complete the purchase. Skyscanner excels for travelers with flexibility. In the search box, you can select Everywhere to search for the cheapest destinations on your chosen dates. If you have a set destination with specific dates, Skyscanner operates like most other travel search sites. There isn’t much that makes this site unique. All of the features offered are available on other sites. Travelocity is yet another OTA that has been around for a while. They offer many of the same benefits as other sites like the Price Match Guarantee and free cancellation within 24 hours. Under the Price Match Guarantee, in addition to refunding the difference in price, Travelocity offers a $50 coupon to use on a future booking of a Travelocity Rate hotel or air and hotel package. This guarantee comes with the usual terms: the lower price must be on an identical reservation from a U.S.-based website within 24 hours of your booking. Travelocity Bargain Fares are opaque bookings, meaning you won’t know all the details of your flight until after your purchase is complete. These flights are featured at the top of your search results and can offer savings if you have flexibility in your schedule. Travelocity Bargain Fares can save you money as long as you don’t mind not knowing your flight details until after your purchase is complete. 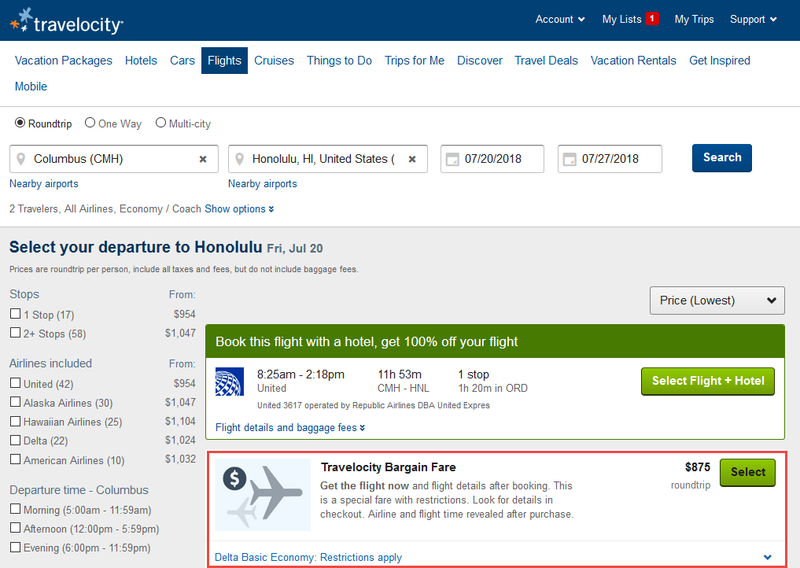 Price Guarantee: If you find a lower price on an identical itinerary within 24 hours, Travelocity will refund the difference in price plus give you a $50 credit to use on a future booking. Travelocity sometimes charges a booking fee. Google Flights is not an OTA. Rather, it’s a metasearch engine similar to Kayak. Once you find a flight, Google Flights will link you to the airline’s direct website or an OTA to complete the purchase. It is a powerful search engine built on the ITA Matrix, which was originally developed for travel agents. Google Flights shows you price trends and how your date of travel could effect the cost of your ticket. Plus, it allows you to track the prices of a route, so you can jump on low prices when they pop up! These features make Google Flights a great tool to help you feel confident that the price you’re getting is a good deal. 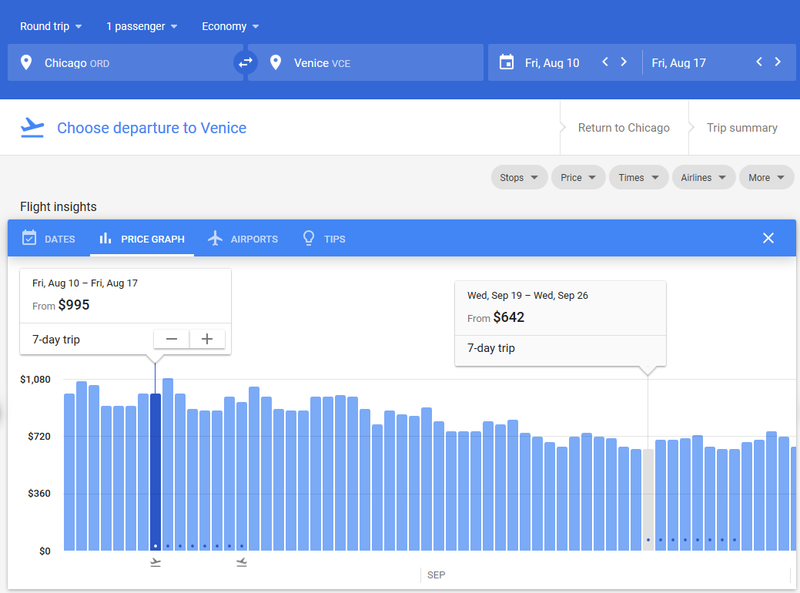 Google Flight’s price graph allows you to see price trends so you can choose the best time to fly! Price Graph shows you the pricing trends for your route and allows you to see what days might be cheaper to fly. 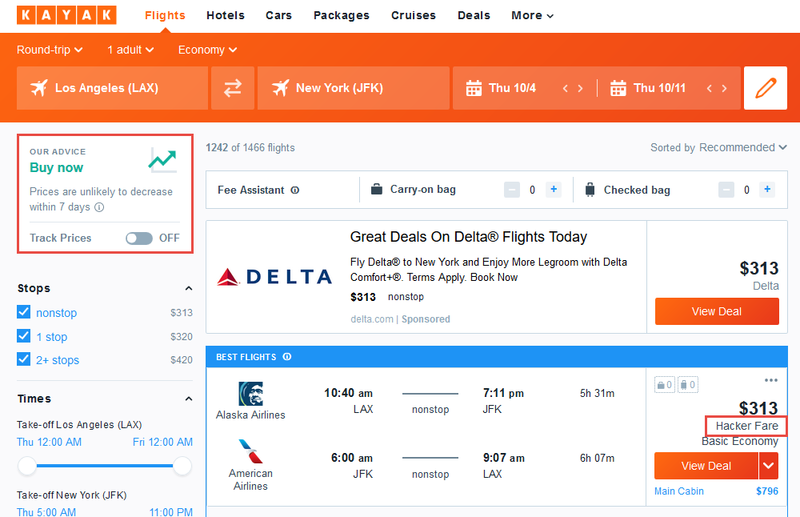 Price tracking will send you an email when your flight’s price increases or decreases. Lots of filtering options so you can customize your search. Since this search engine is so powerful with lots of options, it could get complicated for a novice traveler. Hot Tip: You can earn frequent flyer miles on flights booked through an OTA, but you might not earn miles towards elite status. CheapOair is an OTA that offers its own credit card. The CheapOair credit card offers a $50 rebate if you make $500 in purchases in the first 90 days with no annual fee. It’s great to have options like this, but we recommend a card like the Chase Sapphire Preferred® Card for more lucrative and flexible travel rewards. CheapOair can have expensive booking fees. For a coach ticket, the fees can be up to $35. However, once you read the fine print, you’ll see they can actually be as high as $100! On a flight from Boston to New York, the base price on CheapOair was a couple dollars cheaper than the airline’s website, but once the fees and taxes were added in, the flight was $16 more! This price even included their CheapOpick! Special Offer discount. I did several searches for both domestic and international routes, and most of the time, CheapOair was more expensive. Once, they offered the same price as the airline’s website, but they were never cheaper. You might be thinking you are getting a deal with the CheapOpick! Special Offer, but the hefty fees make this booking more expensive than booking direct. Hot Tip: CheapOair might not be cheap after all. They advertise low base fares, but they charge booking fees which usually result in a higher price than the airline’s website! The CheapOAir credit card offers a $50 rebate after $500 in purchases in 90 days. CheapOair charges hefty booking fees. Price Match Promise is very limited. The guarantee is only good for identical flights on Expedia, Orbitz, Priceline, and Travelocity. 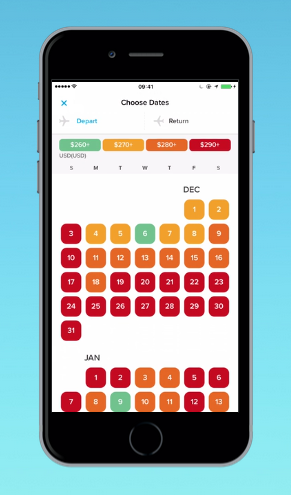 Hopper is an app that tries to predict the right time to buy a flight. They claim using their app can save you up to 40%. on flights. The simple interface and color-coded map show you the cheapest and most expensive times to fly to your chosen destination. You can also set up alerts to watch the prices for your specific dates or watch a whole month if you have flexible travel plans. Hopper offers a great visual calendar to quickly search for the cheapest days to fly to a particular destination. No ability to search on a desktop. Flight Network is a Canadian-based OTA. They offer Price Drop Protection, which means if Flight Network advertises a lower price on your flight, you can receive the difference in price to put towards another booking. Hot Tip: Flight Network prices are shown in Canadian dollars. To view prices in USD, use the drop-down menu at the top right-hand side of your screen. VIP Promo Codes are available after you sign up with Flight Network. Vayama has been around since 2007 but is not as well known as some of the other OTAs. It has a similar set up with filtering options at the left and search results in the middle of the screen. In the top menu, you can click on +/- 3 days to see if changing your plans by a day or 2 could save you money. If you click on the graph tab, you can see at a glance what your best options will be. You can even adjust the duration of your trip to see how that will effect the price. Unfortunately, this site charges hefty booking fees — up to $25 on domestic tickets and up to $50 on international tickets — so any money you might save by shifting your dates around a little could get eaten up in fees. I searched for a flight from Los Angeles (LAX) to New York City (JFK) across different travel booking websites to compare pricing head-to-head. Below is the cheapest ticket each website offered. In this search, I wasn’t taking anything other than price into consideration. When you are actually booking a flight, there will most likely be more factors that go into your decision of which flight to book. In this example, Priceline had the absolute lowest price, followed closely by Hotwire, Orbitz, and Travelocity. Bottom Line: Opaque bookings, which hide details until after the purchase is complete, will usually get you the lowest price on your flight. There is no one-stop shop to find the lowest prices on a flight every time. Most OTAs are in the same ballpark when it comes to price. Opaque bookings tend to offer the best deals, but require a certain level of flexibility. If you don’t mind not knowing your flight times or even your airline, that could be the way to go to save the most money. If you prefer a more traditional booking, start out with a travel search engine like Kayak or Google Flights to search all of the other sites. That will give you a good idea of the best website to use to save the most money on your next flight. Are you a student? Don’t miss our piece on the 6 Best Websites For Cheap, Discount Student Flights. What Is The Best Website To Use To Book The Cheapest Flights? There is no single website that has the cheapest flights all of the time. Most of the travel search engines and online travel agencies all have similar pricing, however you can find some really nice deals when looking at opaque bookings or vacation packages. What Is An Opaque Booking? An opaque booking is one in which many of the flight details including arrival and departure times and even airline are hidden until your booking is complete. Many sites including Hotwire, Orbitz, and Travelocity offer these types of bookings. Will I Earn Frequent Flyer Miles When I Book Through An Online Travel Agency? Generally, yes, you will still be able to earn frequent flyer miles on flights booked through an online travel agency. However, miles earned to qualify for elite status may be not be awarded unless you book directly through the airline’s website. What Are The Best Websites To Buy Cheap Flights To Europe? Unfortunately, there is no easy answer to this question. Your best bet would be to start with a travel search engine like Kayak or Google Flights. 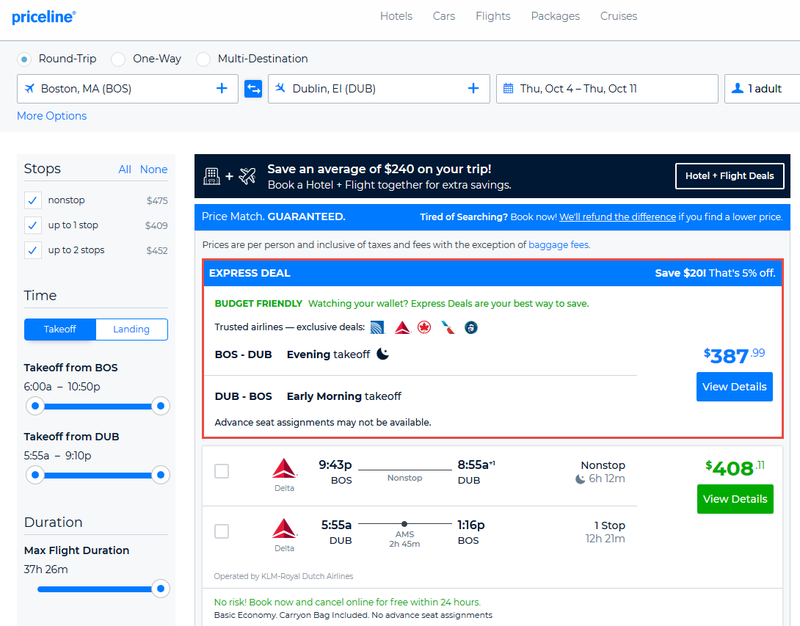 You will be able to see prices from many different websites in one place and you can track flight prices to help determine the best time to purchase tickets. There are many websites which offers information regarding the travel deals and related information ,but in that list these websites are best among them and this article is very helpful. Thanks, Dinesh. I’m glad you found the article helpful! You should also try Farenexus (www.farenexus.com) for easy fare comparisons. 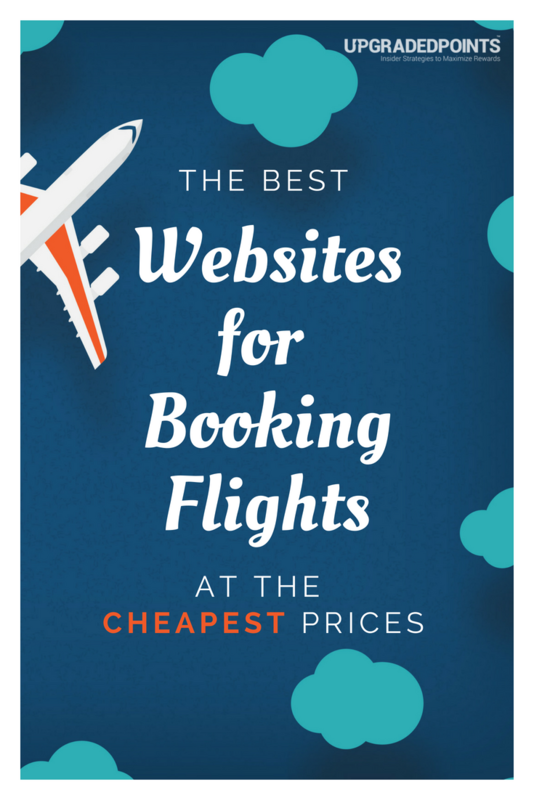 I found the airfares relatively cheaper that most of the above mentioned websites on any given day. Thanks for the suggestion. We will check it out! There are many websites which offers information regarding the air travel deals up to 40% off, but this site is very helpful. Hey Joseph! We appreciate the great feedback. Thank you for your support! We hope to keep publishing material that you find useful and helpful. Hello guys, I have booked my ticket on cheaptickets.com. Don’t ever book tickets on their website. They cheat a lot on the cancellation charges. Actual Cancellation of ticket is 5000 but this particular website charging me 11500. I have booked 2 tickets. Imagine 22000 for 2 for person who wants to save money for booking tickets & end up loosing on cancellation. Imagine their charges are almost more than double. What shall i do about that? A person like me is totally against this. Kindly help guys. Where can I launch a complaint? I’m sorry to hear about this. You mentioned “5000” and “11500” – what currency is this in and what flights were you booking? This will help figure out which department of CheapTickets.com might be the best to contact. Cancellation fees can be complicated so there could have been a misunderstanding there, too. Lots of different factors involved here. I would definitely get in contact with CheapTickets.com first and speak to multiple agents if the 1st isn’t helpful (a good rule in general). Expedia is really nice. Last time I booked my tickets from Expedia using discount coupons from Couponsji and it really cost me low then the usual fair. I loved the experience of saving on air tickets. Hi Mahie, We are glad you found the article useful! Thanks for providing this article. Thank you for your comment, Najitha. Good article and so many good portals are there. I like the information but how about Justfly.com? I want some information also.